One measure of a heavy precipitation event is a two-day precipitation total that is exceeded on average only once in a five-year period, also known as a once-in-five-year event. 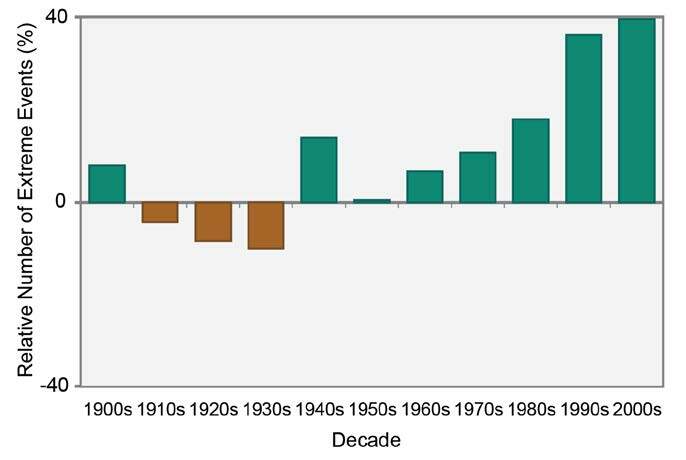 As this extreme precipitation index for 1901–2012 shows, the occurrence of such events has become much more common in recent decades. Changes are compared to the period 1901–1960, and do not include Alaska or Hawaii. The 2000s decade (far right bar) includes 2001–2012. Image credit: Adapted from Kunkel et al. 2013.